Our fun, skill-building workshops for Fall 2018 and Spring 2019 provide great opportunities for girls to earn badges. Programs have a maximum of 20 participants. Cost: $13 per Girl Scout. For more information about History Center Girl Scout programs, email Cynthia Tomerlin at Cynthia.Tomerlin@ocfl.net or call 407-836-8556. If you could go back in time and put yourself in the shoes of a girl or woman, who would you be? Perhaps a Girl Scout in the 1950s, dressed in your poodle skirt and saddle shoes? A Wild West cowgirl? How about a medieval duchess or a Japanese princess? You can be someone who really existed or a historical woman from your imagination. Get ready to live history and learn more about ladies from the past! Cost: $13 per Girl Scout. Adults free. Click here to register. Explore the incredible ways that animals and plants sense the world around them—through light, sound, touch, proximity, and vibration. Using these organisms and their natural sensory systems as inspiration, you’ll use your own senses to extend and learn about your perception of what’s around you. 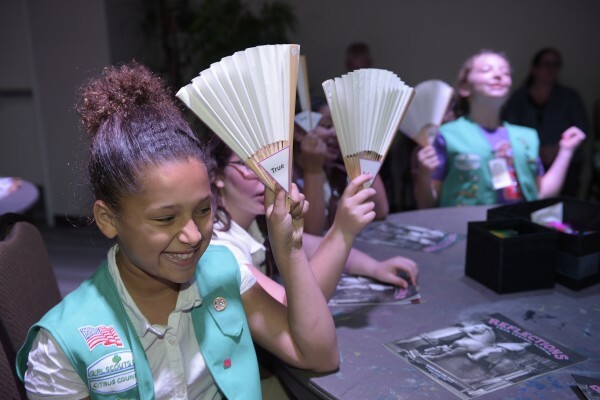 Travel back in time to sip tea with Girl Scouts founder Juliette Gordon Low and learn about Victorian customs such as calling cards, making conversation, and the language of fans. The highlight of the day will be a Victorian tea at which Scouts will learn table manners and etiquette and enjoy a visit from Ms. Daisy! In this enchanting workshop, you will create a miniature container garden that is sure to invite fairies into your world. And who knows—if you build it, they just might come! You will gain knowledge of flowers and plants and learn a bit of fairy history. Once you’re done, you can take home your little garden and feel just a little more magical than when you started! Many people call all insects “bugs.” But did you know that a bug is actually a certain kind of insect? Let’s build a bug house and see what we can put in it. Come along and explore the fascinating world of bugs. We’ll take a closer look at these little creatures and learn all about them! Stories, movies, and television are full of amazing detectives solving mysteries and bringing criminals to justice. Their jobs are important, exciting, and require serious skill! Girl Scouts will learn to crack codes, examine fingerprints, and learn the techniques of solving a mystery! Whether they’re cute, cuddly, slimy, or scaly, pets are so much fun! Being a pet owner is a major responsibility. Pets need love, attention, special care, and of course . . . food! Girl Scouts will learn how to choose the perfect pet and how to keep their pets happy and healthy—whether the pet is a new addition or already part of their family.